New high-quality dual-carriageway to replace the existing single-carriageway A6 from Dungiven to Drumahoe, including a bypass around the south side of Dungiven (Phase 1) and then from Drumahoe to the A2 at Gransha, and an upgrade of the existing A2 dual-carriagway from Caw to Maydown (Phase 2). Mar 2005 - Pilot study to select route from Castledawson to Derry announced. Dec 2005 - Funding announced to build section from Dungiven to Derry. Feb 2007 - Preliminary route corridor selected. May 2008 - Five route options published. 6 May 2009 - Preferred route announced. 14 Dec 2011 - Draft legal documents published. Jan 2012 - Public exhibitions. 24 Sep 2012 to 2 Oct 2012 - Public Inquiry held. ca End Mar 2013 - Inspector submitted Public Inquiry report. 24 Feb 2016 - Departmental Statement published. 21 Feb 2017 - Construction tender released. 15 Aug 2017 - Vesting Order "made". 28 Mar 2018 - Contract awarded for Dungiven to Drumahoe section (phase 1). (changed from "after 2015" as of Jan 2011, and "early 2013" as of Jul 2010). DFI web site on scheme - very detailed information and reports. This is a strip map of the design that was published in May 2009, and is still correct as of the updated design published in February 2016. Note that the design may change between this map and construction due to the evolution of the design, and the public inquiry. 24 Mar 2019: In the last update I commented on the difficulty of getting info on this scheme, but since my previous update the contractor has updated their web site. The contractor confirms that site clearance has now been completed on the entire scheme except for an area in an area in Brackfield and Burntollet. Fencing works have also taken place in the past few weeks on between Tamnaherin and Gortilea; between Ballyhaedin and Munreery; from Feeny Road to Dungiven and near Claudy towards Burntollet. Utility diversions along the route are partially completed with some still to be carried out. 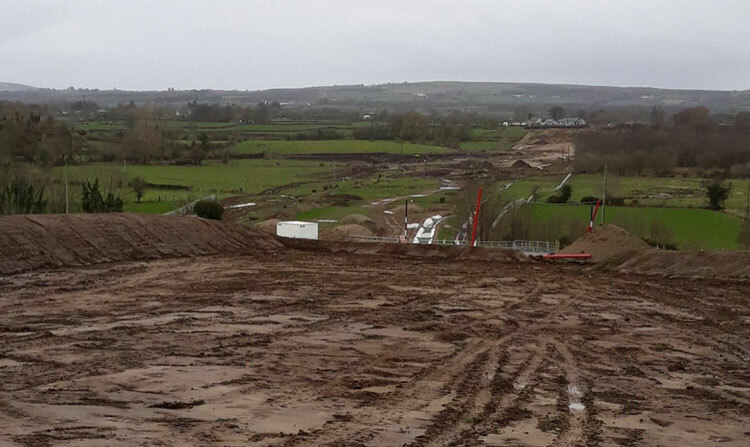 Earthworks are underway at Drumahoe, Foreglen, Munreery and Derrychrier and these are for three public road bridges (Gortilea overbridge, Ballyhanedin overbridge and Altagarron underbridge) and one accommodation bridge underbridge. By the end of March temporary bridges over the Owenbeg and Owenrigh Rivers will be completed, presumably to provide site access for the contractor. Finally, access tracks are being built between Killunaght and Ovil Hill and Feeny towards Dungiven and Munreery. Again these are probably for the contractor to gain access to the site. The update also contains a video – I can't get it to play on my computer, but have a look as it might work on yours! 6 Mar 2019: Work has been undereay on this scheme now for six months, but it is extremely difficult to get information on progress. The contractor has a web site at https://a6d2d.com but it is not being updated frequently or in any useful detail, with the last construction update being posted almost three months ago. This requires us to instead depend on the observations of local people on Twitter, which are proving much more useful, especially Paul McCloskey whose pictures I include below with his permission. 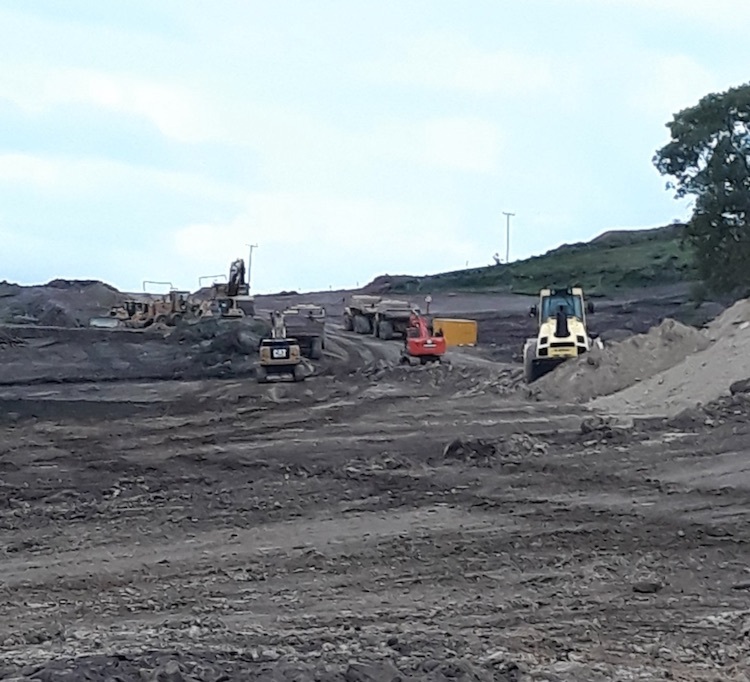 As far as I can ascertain, work seems to be taking place at Drumahoe park-and-ride site; on a major cutting south of of Foreglen and on the Dungiven Bypass section, shown in the photos below. Work also seems to be taking place at various points along the online stretch at the Derry end of the scheme, between Claudy and Tamnaherin Road past Burntollet. The whole scheme is due to be completed three years from now, in spring 2022. 16 Jan 2019: Work is underway again after the Christmas break. According to the contractor, the work before Christmas focused on fencing along the route of the road and on the necessary environmental surveys along the route. This means that site clearance works have not yet commenced on much of the route. Works carried out before Christmas also included culverts at Foreglen and Drumahoe, and the installation of temporary bailey bridges over the Owenbeg and Owenrigh rivers to faciliate construction traffic. More significant earthworks are underway at Foreglen, and these can be seen in this YouTube video posted by the contractor three weeks ago. 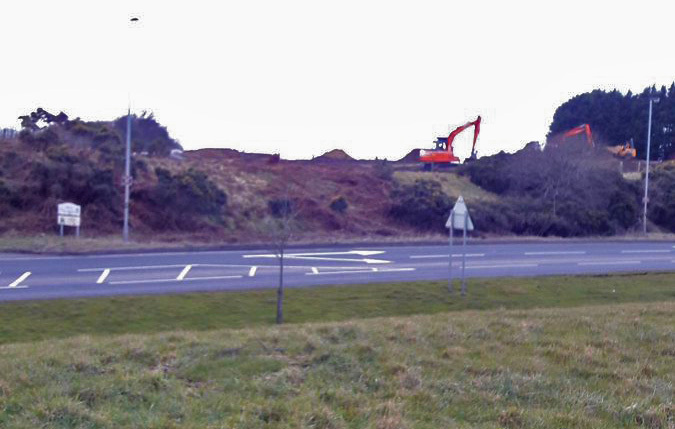 It shows works commencing on the route of the new road above Foreglen GAA club (visible at 1:10). The strip of gravel seen here is on the route of the new dual-carriageway. However, its narrow width suggests that at this stage this gravel is intended to faciliate the movement of construction traffic, rather than being the foundation of the future road. At 1:30 the camera swings round to show diggers working at an excavation. This is the beginning of a much larger cutting that needs to be made in the hillside here. The contractor is starting earthworks at this point and intends to work westwards, ie towards Claudy. With work having now been underway for about four months here's hoping that we see further movement on the ground before too long. 11 Nov 2018: Slowly but surely work appears to be progressing on this scheme and utility diversions (relocating pipes, cables etc) and earthworks have now started. 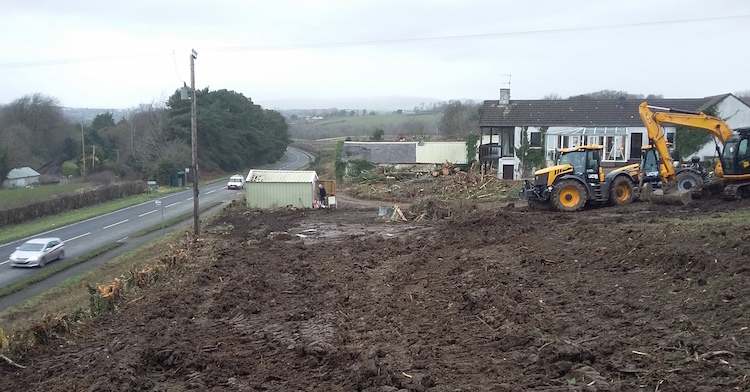 Earthworks appear to be underway at both Foreglen, around half way along the road, and at the western terminus of the scheme at Tirbracken Road in Drumahoe. The works at Foreglen have required the closure of two local road (Crock na Brock Road and Altagarron Road) because a bridge is due to be constructed at that location. The material at the location (peat) is too soft for a bridge, so these initial works involve removing the soft material and the two local roads cross over the site and will be closed for about six months. At the Dungiven end, the contractor has constucted a temporary diversion for the B74 Feeny Road in the locality of the future Dungiven West grade-separated junction. This is presumably to allow the junction to be constructed on the site of the current road. According to the contractor, the next two weeks will see geotechnical works taking place at various points along the western part of the scheme which is to be an online upgrade of the current road. Geotechnical works are essentially to determine the exact nature of the material that lies under the ground and informs detailed design decisions. With thanks to Paul McCloskey for information on the scheme. 6 Oct 2018: The official 'sod-cutting' ceremony took place on the scheme on 26 September (photo 1 below). There is still not much to see on the scheme with the exception of an area around Foreglen where substantial earthworks now appear to be underway (photo 2 below). Motorists are likely to see work progressively ramping up all along the 25 km route over the autumn and winter months, with the initial focus probably being on earthworks (cuttings and embankments) and construction of new culverts for watercourses. Work on the Dungiven Bypass itself will apparently be phased later in the schedule, so may not begin straight away. Nevertheless, a site yard also seems to have been established at Magheramore Road just outside Dungiven. With thanks to Paul McCloskey for information on progress and photos. 18 Sep 2018: Earthworks didn't seem to start in August as the grapevine had suggested, but road users need not be concerned - I now understand that there is to be a sod-cutting ceremony within the next week or so (possibly 26th September). Since the contract was awarded six months ago detailed design work has been taking place. This is a substantial piece of work, involving site surveys all along the scheme to determine things like the exact depth to bedrock, earth composition etc. In addition, further environmental surveys have been taking place. Fencing off the land that has been vested for the scheme is a huge task - the scheme is 30 km long - and as a consequence the process of fencing is going to take until April 2019 to complete. A public consultation (by the contractor, not DFI Roads) took place at the end of June to inform landowners about things like phasing. You can see the panels here. While this also suggested that work would begin in August, it states that "sections" of the new road would be open by Autumn 2021, with overall completion in Spring 2022. I'm told that advanced works have been taking place near Foreglen and also near the site of the future Magherabuoy roundabout in Dungiven. These may be site yards in development. With thanks to the ever-vigilant Paul McCloskey for information on the works to far. 21 Jul 2018: Still nothing much evident on the ground, but things are moving fairly quickly towards earthworks finally getting underway on this scheme. Environmental walkover work has been taking place since the contractor was appointed in March, as well as detailed ground investigation works that will facilitate the detailed design (questions like "So, exactly how far below the ground is the bedrock at the eastern abutment of the bridge?"). The word on the street is that construction work is going to begin in mid August with the creation of a site yard at Feeny Road near Dungiven with construction due to begin there first. After that work will take around three to four years to complete. It's possible that sections of the road, eg the Dungiven Bypass, may be opened earlier than this. The contractor has also followed recent good practice and set up a dedicated web site for the scheme at http://a6d2d.com. The contractor has also put up a video on YouTube that consists of a joint fly-through/drive-through of the whole road. If the road seems a bit like a rollercoaster it's because the virtual car is travelling at about 180mph in order to cover the length of the scheme in the 6 minutes of the video! 24 Jun 2018: I spoke to an engineer recently who is working on this scheme and he confirmed that detailed design work is underway as we thought. The word on the street is that construction earthworks may begin during July, though that has not been confirmed officially. As I said in the previous update, the first visible step will be for the contractor to establish site yards at various points along the site. Once that happens, the bulldozers will follow fairly soon. Meanwhile, DFI are holding information events this week as follows: Wednesday 27 June 12pm-8pm in Owenbeg GAA Club, 471 Foreglen Road, Dungiven, BT47 7PW; and Thursday 28 June 12pm-8pm in The Belfray Country Inn, 171 Glenshane Road, Derry, BT47 3EN. The events are mainly intended to allow affected landowners to find out more about the timetable of works and when their land, specifically, will be affected. However, all members of the public are invited to turn up to find out more about the scheme and have their questions answered. 3 Apr 2018: The DFI awarded the construction contract for phase 1 (25.5 km from Dungiven to Drumahoe, ie the bulk of the scheme) on 28 March 2018. The contractor is a consortium of Sacyr, Wills Bros and Somague (congratulations to them). These companies hail from Spain, Rep of Ireland and Portugal respectively and have not been much involved in road building in Northern Ireland hitherto. The total cost of phase 1 of the project is given as £220m (a bit less than the last estimate), which includes both the construction cost and the cost of buying the necessary land. The cost may not include the planning work that has taken place over the past 13 years since the scheme was first announced, so this may not represent the overall cost of the scheme. 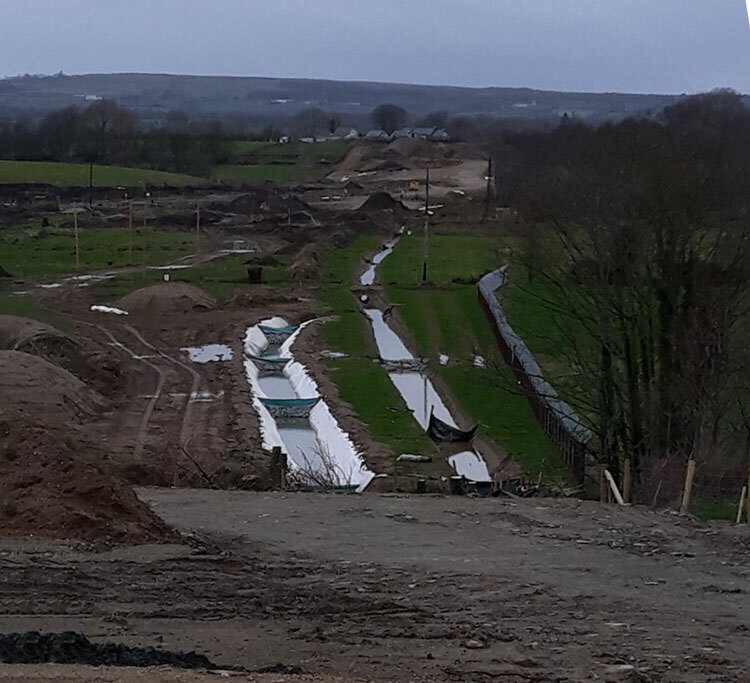 The status of phase 2, essentially a bypass of the Waterside in Derry, is less clear since the route is affected by an illegal landfill whose status is still unresolved. It would not entirely suprise me if phase 2 never gets built as it will become much less of a priority once phase 1 has opened and may struggle to get to the head of the queue for future funding. In any case, I've marked the scheme as "underway" even though proper construction has not yet begun (work visible to date is part of a separate site clearance contract). This is for two reasons. Firstly, it will take a number of weeks for the contractor to mobilise their resources and appoint subcontractors for a scheme of this size, and secondly the contract includes an element of final design work which will need done first. The first signs I would expect to see are the provision of site yards at various points along the route, followed by the arrival of heavy plant equipment and then the commencement of earthworks. Work is due to take approximately four years, so we could expect to see completion during 2022. To clarify - this scheme will see 25.5 km of dual-carriageway built east from Derry, which compliments the separate stretch of new dual-carriageway under construction on the A6 west from Randalstown to Toome. A number of people have asked what is happening to the gap that will remain in the middle, ie the long stretch of single-carriageway from Castledawson to Dungiven via Glenshane Pass. The answer is that DFI currently have no plans to dual this stretch, which is currently the stretch with the lowest traffic levels on the A6. However, there is strong symbolism associated with having continuous dual-carriageways between our two largest cities, so the pressure to plan an upgrade of this stretch will likely be sustained. 13 Mar 2018: The design-and-build construction tender has not yet been awarded, although it is now over a year since it was advertised. The word on the street is that the contractor will be appointed within the next few weeks which could see construction work commence before the summer, depending on how much final design work needs to be done (finalising the design is part of the construction contract). The Vesting order was "made" on 15 August last year, and ownership of the land formally transferred to DFI on 19 September. Meanwhile, an advance siteworks contract has been underway since late last year. This primarily involves vegetation clearance, since trees must be felled by 1 March, the start of the bird nesting season. The photos below show examples of this work. It is most noticeable on the western half of the scheme, between Claudy and Drumahoe, perhaps because this section is to be built as an online upgrade of the existing road. The eastern part, from Claudy to Dungiven, is generally offline and hence not as immediately obvious from the current A6. Archaeological surveys are also underway and geotechnical and ecological surveys have been completed. The scheme will run from Dungiven (including a bypass of the town) to Drumahoe, with the "Waterside Bypass" stretch at the Derry end to be built at an undefined point in the future. The total cost of this phase will be £230-255m and will take "up to four years" to complete, so we could expect to see completion during 2022. This will therefore be the most expensive single road scheme ever undertaken in Northern Ireland (not counting the A5 which has yet to commence), the previous record holder being the 2010 A1 Newry Bypass at £165m. I am very grateful that so many people have emailed and tweeted me with updates on the works along this stretch. There is a real sense of anticipation - it is clearly an exciting time for the North West. 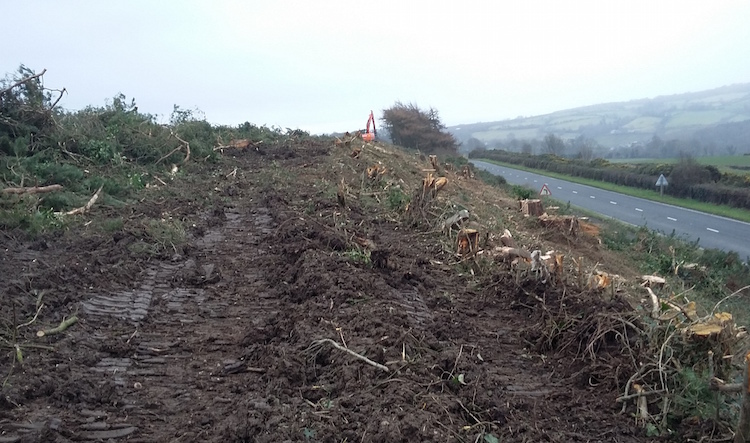 Same location as previously, but looking east showing vegetation clearance well advanced at Tamnaherin Road on 19 Feb 2018. At this point, the current road (on the right) will be subsumed by the new dual-carriageway. [Anonymous contributor]. 5 Sep 2017: With all the publicity being stolen by the other end of the A6 at Toome and its legal difficulties, this scheme from Derry to Dungiven has been quietly advancing to the point of being not too far off commencement. The tender has now been out for over 7 months, so I would expect to see a contractor appointed before the end of 2017. For clarity, the tender is for the stretch of the A6 from Drumahoe to Dungiven only, including the Dungiven Bypass but NOT including the "Waterside Bypass" stretch from Drumahoe to the A2 at Gransha. The reason for this hasn't been widely discussed, but is likely to be related to the unresolved illegal dump at Mobuoy Road, which the route of the new road traverses, and perhaps also the potential for some money to be freed up in the short term by the delayed stretch of the A6 west of Toome. On 15 August 2017 DFI "made" the Vesting Order for the scheme. The Vesting Order is the legal document that transfers ownership of the required land to DFI (an independent body deciding the compensation due to landowners). It exists in draft form throughout the public inquiry stage so that all those affected can see what is proposed, but the act of "making" the Vesting Order is the moment it is triggered and ownership actually changes hands. Since doing this will immediately generate a lot of large bills for DFI, they would not do this until they were confident that work was going to commence in the short term. So this suggests that they are going to begin work soon, perhaps earlier than my previously predicted date of 2019. The scheme has already got at least a partial funding allocation - enough to begin, anyway - and hence commencement does not depend on the existence of an Executive. (Incidentally, it is surely not a coincidence that the Vesting Order was made on the same day as the A6 Toome legal hearing - perhaps DFI trying to make sure that there was at least some good news for the A6 on that date.) Finally, DFI have released a new document for the general public detailing what is being proposed. This includes an image showing how the "temporary" (!!!) terminus at Drumahoe will look, and also revealing that it is to be known as "Lismacarol Roundabout". Lismacarol could well become the Broadway or Sandyknowes of the North West, so expect to hear the name mentioned a lot in traffic reports in the coming years. At the other end, we now know that the roundabout east of Dungiven is to be known as "Magherabuoy Roundabout". 26 Feb 2017: The tender for design and construction of the bulk of this scheme was advertised on Tuesday, 21 February. The tender specifices the stretch from "Dungiven to Drumahoe" including the Dungiven Bypass, so in the strip map above that's everything from the new "Dungiven East" roundabout up to the "Drumahoe" grade-separated junction, ie only omitting the bypass of the Waterside and connection to the A2 at Gransha. The tender specifices "four" grade-separated junctions which implies that the Drumahoe junction will be built as an at-grade roundabout without bridges and sliproads. If so, that makes sense as in Northern Ireland we already have far too many untidy, unfinished junctions without adding yet another one. The value given is £160m (which doesn't include design work to date or purchase of land). That still seems an optimistically low figure to me, but given that the engineers in DFI know what they are doing I am willing to suspend disbelief on this for the time being! Duration is given as 36 months which I would consider normal for construction of a road of this complexity in Northern Ireland. One cannot ignore the timing of this tender release, which has come just over a week before an Assembly election, but it also has to be said that it is entirely consistent with the recent history of this scheme which has got a (partial) budget allocation and has for some time looked likely to commence on the ground by around 2019. The tender is probably a "design and build" tender with a split between the two, so even if a contractor is appointed they will still have a lot of work to do to complete a detailed design, and there is no guarantee from a contractural standpoint that the road will be built. But this is still probably the closest we have come to getting a bypass of Dungiven for several decades. Provided it doesn't get delayed by a legal challenge from environmentalists, as has happened on the A5 and the eastern poortion of the A6, commencement around 2019 and completion around 2022 seems quite plausible. 8 Feb 2017: In December 2015 the two A6 schemes (this one, plus the Randalstown-Castledawson scheme) were given a total cash allocation of £258m for the five years up to 2020/21. Since we know that the Randalstown scheme is currently estimated to cost £160m (in August 2016) that leaves a surplus of £98m that could be used for this scheme. The total cost of this scheme was last stated to be £390-420m in 2014. So the funding allocated up to 2020/21 is enough to build about a quarter of the scheme. That could still allow work to begin close to the end of that time period, on the assumption that further funds would be made available beyond 2020/21. However, the Minister has consistently suggested that the scheme is likely to be broken into sections and built as money is available, and that work would begin at the Dungiven end and work towards Derry. For the past year the question has been how much of the road could be built in the first phase. Given that the road has passed its public inquiry and is now simply awaiting funding and a contractor, work on the first phase could begin as soon as those two items could be put in place. With that in mind, this week a construciton tender appeared on the DFI's "future tender" list for a scheme called "A6 Londonderry to Dungiven Dualling (Phase 1, Drumahoe to Dungiven)" which is for "25.5km" of dual-carriageway with a total cost of £150-170m and a tender release date of February 2017. This suggests that the plan is to build everything except for the 5.3km "Waterside bypass" stretch at the Derry end, which coincidentally is home to the notorious Mobuoy Road illegal dumping site that the route of the road traverses. Three points need to be made about this. Firstly, the timing of the tender release in the final weeks of the current Executive is surely not a coincidence. I get the impression that the current Minister is very keen to make sure this scheme is progressed as far as possible before he loses his job prior to the election. Secondly, the cost of the scheme is greater than the amount of money actually approved by the Executive for the A6 up to 2020/21. When I asked one of the Minister's advisors about this point (see this Tweet and replies) he confirmed that discussions had taken place behind the schenes about getting further funding, but that nothing had actually been approved by the Executive. So I would say IF the election results in a new Executive being successfully formed, and IF Sinn Fein are as influential in that one as they are in the current one, then such funding could well be forthcoming. But that's something we can't say until we see the election result and whether the DUP and Sinn Fein can resolve what looks like a significant rift. Thirdly, the tender value of £150-170m seems low to me for over 25 km of dual-carriageway. Even taking account of the fact that this is the construction cost, and does not include design and land costs, it still seems quite optimistic to me that that much road could be built for £170m. The tender represents over 80% of a scheme whose total cost (including design and land) was estimated in December 2014 to be £390-420m. But I imagine the folks at TransportNI know what they are doing so we shall have to wait and see. Barring a major change to the functioning of Stormont, it is quite plausible that work on this scheme will begin by the 2019/20 financial year as I have said in previous updates. 19 Oct 2016: It has been eight months since I updated this page, mainly because very little has publicly been said about it. We know that the Minister has enough money over the next four years to proceed with some, but not all, of this scheme (about 30% of the required funds are available up to 2020/21). He has already said that he intends to go ahead with the Dungiven Bypass, probably around 2019, and thereafter to work west towards Derry as far as possible from there, but that the extent of this will depend on how much can be built with the money available. There is due to be an autumn budget statement within the next month or so that could potentially make some more money available for this scheme, but that is by no means certain. In a Written Answer in the Assembly in late September (AQW 2761/16-21) the Minister said "Work is underway to determine the extent of the A6 Derry to Dungiven Dualling scheme that can be delivered within the 2015 Budget Statement allocations, with priority being given to commencing construction with a bypass of Dungiven and progressing westwards towards Drumahoe" which has been the official line since Michelle McIlveen was Minister. However, in a Written Answer in July (AQW 1095/16-21) the Minister did note that "in May of this year  my Department appointed consultants to assist with the procurement and delivery of this scheme" which was around the time he became Minister and seems to represent some concrete intention. Meanwhile, the Department for Infrastructure's Business Plan was published last week, and it gives some further guidance on when we might know more. It states a goal to "Develop and agree the procurement strategy" for this scheme and sets a target for March 2017. I would take "procurement strategy" to be offical speak for "figure out how much money we have, what we can built with it and when". So on the basis of all the above I think we might have some more information at the time of the autumn statement, and then further clarity by the Spring of next year. The only other outstanding issue is the Mobuoy Road controversy, basically where a huge amount of illegally dumped waste was found buried along a short part the route of the road at the Derry end. This will need dealt with before work can begin, not least because it was placed there illegally, but also for practical reasons, in that the proposed road is in a cutting at the point in question. Responsibility ultimately lies with DAERA, not the DfI, but it is still an issue for DfI as it directly affects the A6 scheme. In a Written Answer in July (AQW 394/16-21) the Minister explained that "Discussions remain ongoing with the DAERA which is currently considering the management of the site and long-term options for remedial measures. My Department’s TransportNI will align any proposed works with any potential remediation solutions." He also noted that "I am content that, should the contamination issue remain unresolved when the A6 dualling is being constructed, cost effective measures can be deployed to remedy the undesirable effects of the waste." 24 Feb 2016: The DRD has finally published its Departmental Statement into this project. After the road has been planned and designed, it is usually put to a public inquiry. For this scheme that happened in September/October 2012. After that, the Inspector writes a report with recommendations in it and gives it to the DRD. This happened around March 2013. The DRD then study the recommendations and, when they are happy that they have dealt with every issue, publish their response - this is the "Departmental Statement" which was issued today along with the Inspector's Report after almost three years. Why is the Departmental Statement significant? Because, while the road has been in planning for years, this is the moment when the decision to proceed is formally (legally) taken. All that needs to happen now is that funding is allocated to the road and a contractor has to be appointed through a tendering process. This is the complication - there is currently no formal funding allocation, though the Executive did allocate funding for the next five years to the A6 generally in December. Rather than repeating myself, I invite you to read the 20 December update below for the implications of this. Suffice to say that lack of funding for the whole scheme means it will probably not happen at once - the Dungiven Bypass will likely be constructed first, along with a bit more - and the wording of the Minister's press release suggests that the most likely stretch is a section immediately to the west of Dungiven, perhaps as far as Claudy (her wording was "It is envisaged that priority will be given to construction from Dungiven towards Londonderry"). But this has yet to be confirmed. The Inspector's Report largely accepts the DRD's proposals for the road, including the route for the Dungiven Bypass which caused so much controversy at the Inquiry. This route was also backed up by the DRD's subsequent research and that of an independent consultant who then checked the DRD's work. So the scheme will be going ahead largely as planned. 29 Jan 2016: In the previous updted I reiterated that there seems to be enough money to build some, but not all, of this scheme over the next five years. The assumption is that the Dungiven Bypass will go ahead, but there seems to be money to build a bit more than that. So the question is, what will be built? In a Writtern Answer in the Assembly this week (AQW 52772/11-16), the Minister said TransportNI "are currently reviewing the extent of this scheme which can be built with the funding allocations in the December 2015 Budget Statement. Once I have received these reports and considered them in full, I will make a decision on how the scheme should proceed." So basically the engineers are working to answer this very question. There are various possibilities (eg all of Dungiven-Claudy; or perhaps Dungiven plus the Waterside "bypass" at the Derry end) but with so many options I'm not prepared to put my money on any particular variation just now! But she finished with the clearest indication yet that the Dungiven Bypass will be going ahead after half a century of waiting, saying "allocations for the 2017/18 – 2020/21 period will allow my Department to construct elements of the A6 Londonderry to Dungiven dualling scheme, which includes a bypass of Dungiven". Assuming it does go ahead, I think we're still perhaps three years away from construction starting on the Dungiven Bypass which I estimate could start in the 2019/20 financial year. Nothing is certain until the bulldozers move in, but it's looking promising. 11 Jan 2016: In my post a month ago (9 Dec, below) I expressed frustration with the time it has taken for the DRD to publish its response to the Public Inquiry, the report of which they received almost three years ago. I also gave some possible reasons. The DRD Minister was explicitly asked this question in the Assembly today, and she was adamant that the delay is the first of the three reasons I gave, namely ongoing work assessing alternative routes around Dungiven. It is worth quoting her at length. She said "One of the inspector's recommendations was that an alternative route for the Dungiven bypass be considered in sufficient detail to allow an informed comparison to be made between it and my Department's published route. Transport NI's project consultant subsequently reviewed the alternative route, and its findings endorsed my Department's published route. However, there was a view that that was not sufficiently independent and may not have given the alternative route a fair consideration, so an independent review of the alternative route was commissioned by my Department and has now been completed. Reports have been prepared outlining the findings of the review and addressing the other recommendations arising from the public inquiry. Once I have received those reports — I have not as yet — and get the opportunity, I will consider them in full and make a decision on how the scheme should proceed after that." There is no reason not to take this at face value, though I still think that the other two reasons I gave are probably also playing a role. Meanwhile, in the previous update (20 Dec, below) I commented about the implications of recent funding allocations for this scheme. I noted that there seemed to be enough money to build some, but not all, of this scheme over the next five years and this assessment was confirmed in the Assembly today when the Minister said the DRD "are reviewing the extent of the scheme which can be built with the funding allocations in the December 2015 Budget statement". It could be that they decide to progress the Dungiven Bypass alone, as I suggested below, but it may be that they decide to build a bit more, for example the whole bit from the Dungiven Bypass to Claudy. It sounds as if the Minister will be making an announcement on this in due course, though probably not in the immediate future. 20 Dec 2015: Three days ago the Finance Minister delivered her budget for the next financial year. This budget included funding of £21m in the 2016/17 financial year (April to March) for the A6 and also committed £57m, £60m, £60m and £60m for the following four years. Now, let's clarify that there are currently TWO A6 schemes - Derry to Dungiven, and Randalstown to Castledawson. 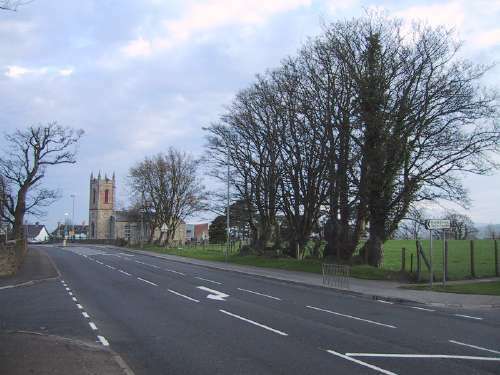 The cash allocated is likely to mean the other A6 scheme, the one to build a dual-carriageway from Randalstown to Castledawson, is likely to go ahead around April 2016. That scheme is estimated to cost £140m, so the first three years of the aforementioned cash allocation should cover this. That means that there is still £120m allocated to the A6 for the final two years, and that could only be spent on this A6 scheme. I have blogged my thoughts on this in more detail here, but the bottom line is that I think we could see the A6 Dungiven Bypass detached from the main scheme and work get underway during the 2019/20 financial year. I need to stress that this is my own estimate - the DRD have not said anything about timescales for any of these schemes. The total estimated cost of the A6 Derry-Dungiven scheme is £420m, and the cash allocation above is much too low to allow all this to be built, but the cost of the Dungiven Bypass portion alone is only £65m, which is LESS than the £120m allocated for the last two of the next five years. So it's possible that the intention is to start the ENTIRE Derry-Dungiven scheme in 2019, and carry on beyond the five year period mentioned in the budget with further funding allocations at that time, or possibly before. But we shall see. For now, I think there's a reasonable chance that we're within three to four years of work beginning on the Dungiven Bypass. 9 Dec 2015: This scheme is still deafening in its silence. The Public Inquiry happened in autumn 2012 and it is now almost three years since the Inspector submitted his report to the DRD, and almost two years since the Minister said that he would be publishing the DRD's response (the Departmental Statement) shortly (see update 10 Feb 2014 below). It is inconceivable that it has taken the DRD three years to digest the report, so there must be something else holding it up. Some possibilities are (a) Consideration of the "alternative route in the vicinity of Dungiven" that the DRD keep alluding to when asked what is happening. Although the Inspector's report has not been published, it seems to have recommended consideration of an alternative route. It's possible, though I think unlikely, that consideration of this alternative route is taking this long. (b) That the scheme is being held up by political and financial considerations. The Executive has had conflicting priorities on road building due to insufficient cash to build everything desired, and both the A5 and York Street Interchange have seemed to be higher priorities in the Executive. The Minister may have been working on the basis that not publishing the Departmental Statement effectively parks the project and avoids questions about timescales getting more awkward. (c) The Mobuoy Road controversy. 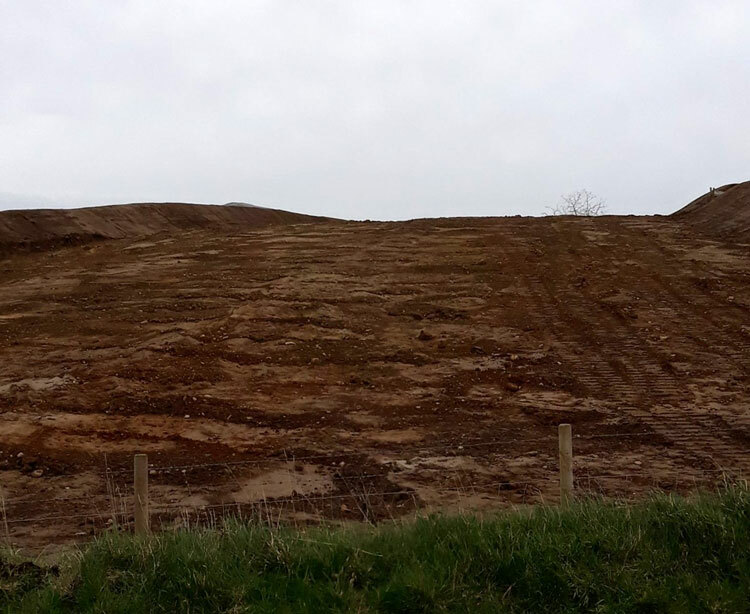 In June 2013 a large illegal landfill site was discovered at Mobuoy Road, near Londonderry with about 1.5 million tonnes of illegal waste in it. The site has still not been dealt with. It impacts on this scheme since part of the site is to be purchased by the DRD to build the A6 dual-carriageway (which would be in a cutting through much of the area in question), but also for flood control measures and some local road realignments. The scheme design was developed prior to the discovery of the site and so it did not take the illegal landfill into consideration. 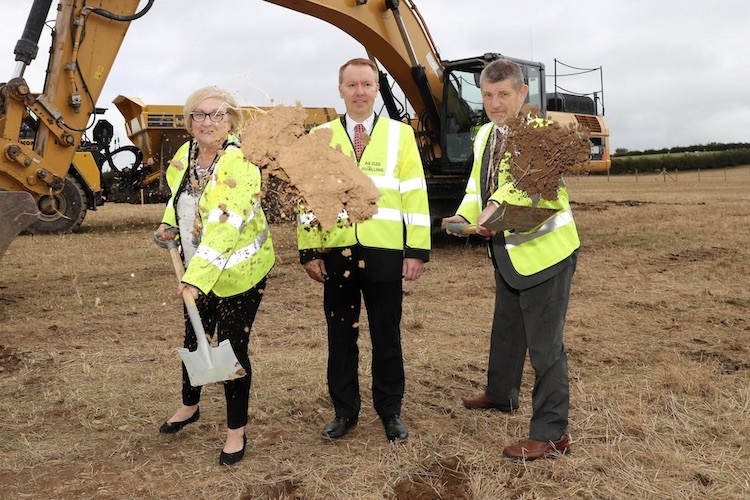 Although the DRD are adamant that the illegal landfill will not affect the project, it inevitably will because the site will have to be decontaminated in some shape or form before the road can be built. It's possible that delaying this project avoids this becoming a more toxic (excuse the pun) issue. Finally, while the DRD Minister did comment back in September 2014 that he had decided that the Dungiven Bypass "could" be decoupled from the rest of the scheme and implemented at an earlier date, nothing more has been said about this possibility. As the only town on the entire Belfast-Derry road that is not bypassed, and one that is experiencing significant air pollution and congestion, this really should be well up the priority list within DRD. This gives a total scheme cost of £390-£420m which is more than the figure of £350-£390m that has been quoted since 2011. This is very expensive, and it is unlikely in the current climate that this kind of money will be available in the near future. 14 Sep 2014: It has now been a year-and-a-half since the DRD Minister was given the inspector's report into the public inquiry into this scheme which was held in September and October 2012. In February 2014 he had indicated that he would make a statement "later this financial year", which presumably meant April 2014, but this date also came and went with no statement. So it has now been 18 months since he received the report, so it's getting a bit hard to explain the ongoing absence of any statement. One possibility is that Northern Ireland's financial situation is so uncertain, and with the way forward for the A5 scheme still not being clear, that the Minister does not want to rashly commit to a particular course of action that he may not be able to follow through with. Another possibility is that the Inquiry Inspector has identified an issue that is proving particularly lengthy to resolve. The Minister was asked about this very issue in the Assembly on 8 September, when he said "I am considering a response to [the Inspector's] recommendations and will issue the departmental statement in due course when I am satisfied that all issues, a number of which are complex, have been appropriately reviewed." This is very vague. Although he says some of the outstanding issues are "complex" this doesn't necessarily imply that this complexity is the root cause of the delay, which I tend to suspect is more to do with financial uncertainty. However, he did give great hope to the people of Dungiven - the only non-bypassed town on the whole Belfast to Derry route - by basically saying that the Dungiven Bypass will be built ahead of the whole scheme. When asked if he would consider "decoupling the bypass at Dungiven from the larger project" his reply was "I am happy to confirm that I have taken the decision that the various components of the entire scheme can be decoupled. Subject to the finance being made available and the other issues being resolved, we can proceed." That is as close to a commitment as I have seen to date and is a very positive sign that this is going to be what happens. So I think we can expect that when the Minister finally makes his statement, it will be to say that the scheme is to be broken into two parts - the Derry to Dungiven stretch, and the Dungiven Bypass with the latter to progress first. 10 Apr 2014: Based on the comment the Minister made in February 2014 (see below) I had expected us to have the Inspector's Report from the Public Inquiry and the DRD's Departmental Statement by now. This latter document is the one outlining how the DRD will respond to any recommendations the inspector made and setting out what they plan to do next. However, in the Assembly a few days ago the Minister was asked about the scheme and explained that "we are still considering the inspector's report arising out of the public inquiry. The issues are not yet concluded, and we hope to make progress on outlining our thoughts on that in the not-too-distant future". So it seems we'll have to wait a bit longer. Certainly the political pressure on the Minister to detach the Dungiven Bypass element of the scheme and progress it before the rest of the scheme is great, and I would not be surprised if this is what eventually happens in the face of tight budgets. 19 Mar 2014: In the Assembly yesterday, the Minister gave an update on this scheme. This isn't the official statement that we're still anticipating in the near future (see previous update below), but is useful nonetheless. We have known since June 2012 that the DRD has prepared a plan to split the scheme into two bits, which would allow the Dungiven Bypass stretch to be built ahead of the rest of the scheme in the evening of full funding being an issue. In the Assembly today, he added that it would be possible to split the project into three by also separating off the upgrade of the short stretch of the existing A2 at the Derry end of the scheme (Maydown to Caw roundbout). In reality, this is a relatively tiny component of the whole scheme, so doesn't change that much. The long (approx 25km) stretch from Dungiven to Maydown roundabout constitutes the bulk of the scheme. We are still waiting for a more formal announcement within the next few weeks which should set out more clearly what the Minister intends to do next with this scheme. 10 Feb 2014: Ten days ago I commented that it was now some time since the DRD Minister had received the report from the Inspector of the Public Inquiry that sat in September 2012, and this week the Minister was asked about it via a Question for Written Answer. He said "I expect to make a Departmental Statement on the way forward later this financial year", which presumably means by the end of March 2014. A Departmental Statement is the document usually released along with the Inspector's Report and outlines how the DRD will respond to any recommendations in the Inspector's Report and sets out a decision on whether or not to proceed. However, this does not mean that the construction process would then begin, as the scheme then has to wait for legal orders to be made (eg, to buy the necessary land) and most importantly for funding from the Executive, which may not be forthcoming at this time since the Minister has previously indicated that he's unwilling to progress both the A5 and A6 schemes simultaneously. 31 Jan 2014: In my update on 15 April 2013 (below) I noted that the DRD Minister had received the report from the Inspector of the Public Inquiry that sat in September 2012. Experience of recent years is such that I anticipated that this would be published before the end of 2013, but this has not happened. They're not obliged to release it under any particular timescale, but I'm just flagging up the fact that they've now had it for almost ten months, which is quite a long time. Perhaps there is a reluctance to publish the report ahead of a funding announcement as this would simply draw attention to the fact that this is yet another scheme serving Derry that hasn't gone ahead! There is still nothing more on the suggestion that the Dungiven Bypass scheme might get split off and implemented at an earlier date than the rest of the scheme, despite ongoing local interest in the matter. 1 May 2013: In my previous update I commented that with the 12-18 month delay to the A5 project, the "Dungiven Bypass" element of this scheme must surely be high up the list of possible alternative schemes to be progressed in the meantime. In the Assembly yesterday the Minister seemed favourable to the idea when that precise question was put to him. He said "I am pleased to confirm that the design of the scheme allows for the Dungiven bypass to be taken forward and completed as the first phase of the scheme. It will provide 4·8 kilometres of dual carriageway bypassing Dungiven to the south at a total cost in the range of £60 million to £80 million. The construction of this element of the scheme would be dependent — and this is the key thing — on the availability of finance in subsequent periods." The last sentence is something he 'has to say' since the Executive has not yet agreed how the A5 money will be reallocated, but the first two sentences show that decoupling the Bypass section from the larger scheme is a distinct possibility. The main bit of work still to be done is the analysis of the Inspector's Report from last September's Public Inquiry which has been received but not published. 15 Apr 2013: According to a Question for Written Answer in the Assembly, the DRD Minister has now received the report from the Inspector at last September's Public Inquiry. This is almost exactly to the timescale predicted at the end of the Inquiry (see update below for 4 Oct) which is nice. The report will not be published just yet. Typically, the DRD take a few months to examine it and respond to any recommendations before publishing both the inspector's report and their response (called a "Departmental Statement") simultaneously. We could expect to see this before the end of 2013. Given the recent delays on the A5 project, the "Dungiven Bypass" element of this scheme (a small but critical part of the whole scheme) is surely high up on the list of possible schemes to be taken forward at an earlier date, so it is very timely that the Public Inquiry report has been received. Let us hope that there were not too many issues with the plans. 24 Oct 2012: For those with a particular interest in this scheme, Roads Service have just published transcripts of the six day Public Inquiry that took place a month ago. You can download them here. This is only the third time that I know of that Roads Service have published such transcripts (the first two being for the A55 at Knock and the A5 WTC) and is a very welcome development for public transparency. Happy reading! 4 Oct 2012: The Public Inquiry into this scheme took place as planned from 24th September to 2nd October, and finished on schedule having heard over 125 objections. The Inspector, JA Robb, will finish by conducting site visits on 9th and 10th October. The DRD say that they expect the Inspector to submit his report "before the end of March 2013", but it is important to note that it will not be published at that point. The DRD typically take a few months more to consider the recommendations and outline their response before publishing it. So we might expect to see it around the summer time next year. Detailed information about the objections, along with transcripts of the Public Inquiry are (or soon will be) available here. With thanks to Paul McCloskey. Some (including me!) are speculating that the unexpected delays to the A5 scheme over the past month might free up some money over the coming months that could potentially be redirected to the Dungiven Bypass element of this scheme. This is quite possible, since the Minister has already indicated that he is sympathetic to the idea of proceeding with the Dungiven Bypass ahead of the rest of the scheme. Watch this space. 26 Jun 2012: We now know that the Public Inquiry into this scheme will begin at 10am on 24 September 2012, in the Roe Park Hotel, 40 Drumrane Road, Limavady BT49 9LB. The Inspector will be JA Robb, who was also the Inspector for the A8 Larne Public Inquiry and the A6 Castledawson-Randalstown dualling Public Inquiry. Roads Service has also published their pre-Inquiry Departmental Statement, which sets out in considerable detail their case for building the road as proposed. This contains some interesting historical information and is worth a read for that reason alone. In another interesting development, speaking in the Assembly yesterday the DRD Minister gave a strong hint that the Dungiven Bypass section may be decoupled from the rest of the scheme and built separately. They had previously resisted this as it was anticipated that the entire A6 scheme would proceed before too long, and hence there was little to gain by dealing with Dungiven separately. However, as it now seems as if it could be some years before the scheme is built, there would now be merit in building the Dungiven Bypass scheme separately (see update below for 14 Feb 2012). The Minister said: "I can confirm that it will be possible to bring forward the draft statutory Orders for the construction of the bypass at Dungiven ahead of and without compromising the future delivery of the remainder of that scheme. However, this is, of course, all conditional on available funding." This is interesting news. 24 Jun 2012: The DRD Minister has announced that (not surprisingly) a Public Inquiry will be held into this scheme, since it attracted 122 objections during the consultation period between December 2011 and March 2012. The Inquiry will probably be held in late September, and further details are due to be released this week. This is later than anticipated last summer, but still welcome. There is currently no financial commitment to actually build the scheme, but it is important to keep progressing the scheme so that it is 'good to go' if and when money becomes available. 14 Feb 2012: Today saw a major announcement of how the money for roads will be spent over the next four years. This scheme was not among them. This was not surprising, but until now we have had at least hoped that it might begin around 2014/15 (see update below for 11 May 2011). Today's announcement means it won't commence until at least 2015. However, it is disappointing that the Minister has not at least chosen to press ahead with the Dungiven Bypass element of the scheme. 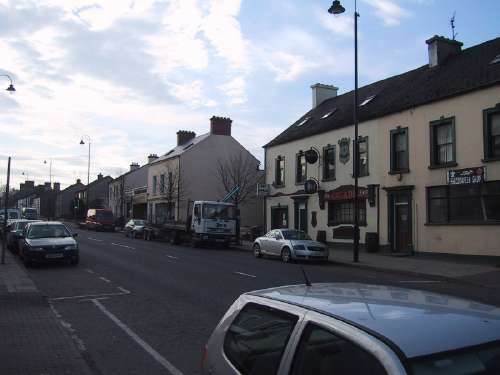 Dungiven is the only town not bypassed on the entire A6, and all the traffic pollutes the village. However, it should be said in the Minister's defense that the scheme has not yet had its public inquiry, and this means even the Dungiven Bypass could not commence for at least a couple of years, even if it was decided to go ahead with it separately. The money that is available needs to be spent sooner than that timescale would allow. The deadline for comments and objections is 2 March 2012. For those interested in history, this scheme page now contains links to multiple historical documents. The layout of Killaloo junction west of Claudy has been amended slightly - I have altered the strip map above to reflect the new design. Ballyhanedin Road junction east of Claudy has been dropped - the road will be bridged over the A6 but with no access to the A6. Killunaght Road junction near Foreglen has been dropped - the road will be bridged over the A6 but with no access to the A6. 4 Jul 2011: The Minister has confirmed that the draft legal documents required to build the road will be published "later this year", and that the Public Inquiry will likely be held in Spring 2012, slightly later than expected in April. This does not imply that the road will go ahead any earlier than previously stated, merely that Roads Service want to press ahead with the process so that, subject to the Inquiry, construction of the road can go ahead once finance is available. 14 May 2011: Speaking at the Annual Dinner of the Chartered Institution of Highway Enginners Northern Ireland, the Permanent Secretary of the Department for Regional Development Malcolm McKibbin said "development work is proceeding on the A6 schemes and late changes to the draft budget mean that we should also be able to start construction in the last year of the budget period" (quoted in Plant & Civil Engineer, May 2011). There are two "A6 schemes" - this one, and the scheme to dual the A6 from Randalstown to Castledawson. The Minister's comments last month about Dungiven (see previous update) suggest that Mr McKibbin may be referring specifically to this scheme when he says that construction should be able to start, but it's possible he means both. Previously both schemes were delayed until at least 2015. The "last year of the budget period" is the financial year running from April 2014 to April 2015. 27 Apr 2011: The Minister has confirmed in a Written Answer that development work will proceed on this scheme over the next few years, despite there not being enough money to build it. In particular, he suggests that the draft legal documents required to build the road will be released in late 2011, and that the Public Inquiry is likely to take place in "late 2011/early 2012" - somewhat later than was anticipated last Autumn. He also implies again that the 2.5km Dungiven Bypass may be built ahead of the main scheme. The cost is now being given as "£350m-£390m", slightly higher than the figure of "£320-£390m" being quoted in late 2009. 7 Mar 2011: Roads Service have come into some new money, to the tune of £107m, and this press release suggests that some of it may be put towards the A6. The Minister does not say which of the two A6 schemes it refers to (Randalstown to Castledawson or Derry to Dungiven), but his comment that "the Dungiven Bypass will be the priority" suggests it is this scheme. The money is nowhere near enough to complete this entire scheme, so it is possible that the 2.5km Dungiven Bypass section may proceed before the rest of the scheme - but this is not stated, so we don't know. Dungiven is singled out because it is now the only town on the entire Belfast to Derry route that is not bypassed. 14 Jan 2011: Roads Service have revealed their budget for 2011-2015 and, due to lack of money, this scheme has now been put on hold, seemingly until at least 2015. The only note is that funding will be available to "continue development" of the project, but not actually build it. In the reduced funding climate all available monies are being funnelled into the A5 and A8 schemes. 19 Oct 2010: In a Written Answer in the Assembly, the Minister has said that the legal documents that are required (see update below on 16 Feb) will be published in early 2011, which represents a bit of slippage on the dates given earlier this year. The estimated date of the Public Inquiry is now being given as "summer 2011". Assuming the public inquiry passes the scheme, and subject to the availability of finance, the Minister is saying that work should begin in 2013. Due to the inevitable budget cuts in the coming months, the Minister for Finance has asked all other Ministers to suggest how their budgets could be cut. However the Minister for Regional Development is currently reluctant to suggest places were cuts could be made in his department, which makes it impossible to assess whether or not the 2013 date is realistic. Hopefully the situation will become clearer in the near future once firm decisions have been made. A number of "Health Impact Assessment" workshops were held in late September, and details can be found on the Roads Service web site. It's not immediately clear from the material on the web site what material impact this will have on the scheme. 18 Aug 2010: In a briefing to Derry City Council in July, Roads Service have said that work on this scheme is still expected to begin in "early 2013". However, we should not rely too much on this since the important budget decisions due to be taken in the coming months are likely to impact on roads. 16 Feb 2010: According to the Minister in the Assembly on 8 Feb 2010, design work is continuing and Roads Service hope to publish the draft Direction Order (basically the legal document giving permission to build a new main road) and the draft Vesting Order (the legal document needed to buy the land to build the road) "before the end of of 2010". The cost was re-stated, and has not changed, at £320m-£390m. 18 Jan 2010: The terminus of the new road at the Derry end will require changes to the A2 Clooney Road, mainly involving improving the alignment and standard, and removing one roundabout. A public exhibition of what is proposed will take place at The North West Teachers Centre, 24 Temple Road, Strathfoyle on Tuesday 19th January 5pm-9pm and Wednesday 20th January 1pm-9pm. I would encourage all those with an interest in the scheme to turn up as this is one of the main ways that the public can engage with the planners. 7 Jan 2010: According to a Written Answer in the Assembly in late December 2009, the current estimate of the cost of this scheme has risen to "£320m to £390m" which is a further increase on the "£320m" estimated in December 2008. 6 May 2009: The Minister announced the preferred route today. The new road will be built to dual-two lane standard, with 1 metre hard strips and no central reserve crossings. Starting at a new roundabout east of Dungiven, it will bypass Dungiven to the south before following an offline route for the first 10km. It will then join the existing A6 where it will be an online upgrade past Claudy until close to Drumahoe. It then heads cross country again to the north to join the existing A2 road at a new roundabout at Gransha. This is quite far north, so we could expect a large percentage of motorists will elect to leave the road at Drumahoe and use the existing A6 past Altnagelvin rather than go all the way up to Gransha. All seven intermediate junctions will be grade separated - six with a "compact" design and one (Drumahoe) with a larger layout. There may also be a westbound left-in/left-out junction at Burntollet, but the Road Service map is not clear enough to determine if this is true. I have put an approximate version of the route onto a Google Maps overlay, seen by clicking here. The press are reporting that construction will start in 2012 and last until 2016, but this is not stated in the Roads Service material. The official position late last year was construction commencing in 2013 subject to the availability of funding. All those with an interest in the scheme should be urged to turn up, as this is one of the key meetings to have your questions answered and raise any concerns. Representatives from Roads Service and the design company will be there. 16 Dec 2008: According to a Stormont Assembly written answer last week, the estimated cost of the scheme has now risen to £320m. It confirms that the preferred route is due to be announced in the Spring of 2009 and again tentatively suggests commencement may be around 2012/13. 10 Dec 2008: Roads Service published a 4-page leaflet on the scheme last month. It does not contain any new information, but confirms the timescale previously announced and provides a useful summary of the scheme. 21 Oct 2008: According to an Assembly written answer from 17 October, the scheme is still on schedule for commencement "during the 2012/13 financial year". The answer also states that the Dungiven Bypass portion of the scheme will take about 18 months to complete. There have been hints that this part of the scheme may progress early on in the scheme to ensure that it is open as soon as possible. 15 Jun 2008: According to this press release, the cost of the project has risen to £300m (up from £250m estimated in 2005). It also revealed that the preferred route is due to be announced in the summer of 2009 and that "over 100 people" are involved in the route development in one form or another. The press release has also said that Roads Service are now investigating how to provide a link from the A6 at Drumahoe to the A5 on the south side of the city. Such a link would almost certainly follow a new offline route. It is unclear if this link would be part of this scheme, or be a separate project. 24 May 2008: Roads Service are holding a series of public exhibitions between 20 and 28 May. They are using these to reveal the five chosen route corridors. Interestingly, some of these stray OUTSIDE the route corridor announced last year and thus there is now an "expanded" route corridor. At the Derry end it now looks almost certain that the road will tie in to the existing A2 between Caw and Maydown rather than the Crescent Link itself. At the Dungiven end two new routes for the bypass of the town are being considered, after complaints about the current route that will sever a GAA training ground. One of these passes further to the south, beyond the river, while the other passes to the north of the town. All the documents made available on the days are also online here, including more detailed versions of the above maps. 28 Apr 2008: The publication in April 2008 of the "Investment Delivery Plan for Roads" document has allayed fears that the scheme will be delayed, since it includes this scheme in the "Preparation pool" which contains schemes anticipated to begin within 5 years, ie by 2013. 8 Mar 2008: According to Roads Service, ground surveys on the chosen route corridor are underway. This will inform the decision on a preferred route within this corridor. Roads Service still have the scheme in their "preparation pool" (construction anticipated within 5 years or so) but with the recent announcements by Conor Murphy (see previous updates) it's still unclear what the timescale is. 5 Feb 2008: Conor Murphy has again denied that there is any slippage in the timetable for the project. He said that "it is not correct to state that there has been slippage on the A6 Derry to Dungiven project. Indeed in July 2007 I announced the appointment of consultants to examine options to enable the selection of a preferred route by spring 2009". There is no doubt that this is true, but it only refers to the first element of the project. The "slippage" being noted is in the timescale for completion of the project as a whole. When first announced,Roads Service were saying that the scheme would be delivered within the timetable of the Regional Strategic Transport Plan which ran from 2005-2015. Now, they are saying that it's going to be delivered within the timetable of the Investment Strategy 2008-2018. While it's only a time period, it still has the potential to delay the project by up to three years. 30 Dec 2007: Conor Murphy responded to the media reports last week by assuring business leaders that the scheme has NOT been cancelled and will proceed. However, while reassuring, his statement does seem to be a disguised attempt to sneak a revised timescale through. When the scheme was first announced in 2005, it was stated that it would be built within the timescale of the Regional Strategic Transportation Network Transport Plan 2015, ie by 2015. However in this week's statement, Conor Murphy now says that it will be built within the timescale of the draft Investment Strategy 2008-2018, ie by 2018. This subtle change means that the project could potentially be delayed by up to three years. This would seem inevitable give the level of financial committment required for the A5 dualling scheme. 24 Dec 2007: As has been noted by the media, this scheme is mysteriously missing from the Draft Investment Strategy 2008-2018 which was published in October. This Strategy (admittedly a draft) outlines the targets of spending of £3bn on roads over the next ten years. Under its list of "key milestones" it lists the A4 dualling scheme (Dungannon to Ballygawley), completion of the A1 dualling, completion of the M1, M2 and Westlink upgrades, the recently announced A5 dualling scheme (Londonderry to Aughnacloy) and the A8 dualling scheme (to Larne). However there is no mention of the A6 dualling scheme. According to Derry Chamber of Commerce, the DRD has said that the A6 scheme may be put on hold or delayed. This is speculation, but it is worth noting that the shortfall required in order to undertake the A5 dualling scheme is £260m. This is almost the same amount as the cost of this scheme. So it is possible that the Regional Development Minister Conor Murphy has decided to take the money from this scheme and use it to fund the A5 scheme instead. If so, and it is only guesswork, then it is likely to prompt a lot of debate on the subject. B3.3.41 When the funding envisaged by RTS is extended to 2015, there would be £529.4m available for Strategic Road Improvements in the RSTN TP period. However, this is fully taken up by the high priority SRIs proposed across the RSTN, including the £171.9m envisaged for SRI schemes on routes serving the North-West. Therefore, within the funding assumptions of this Plan, it would not be realistic to expect that further dualling of the A6 could be undertaken within the Plan period (apart from the Randalstown to Castledawson section already proposed). B3.3.42 However, further dualling of the A6 will be required outside the RSTN Plan period, in order to develop and upgrade the link between Northern Ireland’s two largest cities by 2025. Therefore, during the Plan period it will be necessary to plan the route of a dual carriageway between Castledawson and Derry, by undertaking a route selection study. This will inform the decision regarding the acquisition of land and route protection lines, e.g. for the Dungiven Bypass. Thanks to Diarmaid Elder for the traffic information on this page. Lots more photos of the road are available on the Roads Service web site - see link at the top of this page.